(Newser) – It would have been the largest tech acquisition ever, per CNBC, but Qualcomm is saying no thanks. It rejected an unsolicited, $103 billion offer from Broadcom, saying that the proposal is significantly undervalued and that a tie-up between the massive chipmakers would face substantial regulatory resistance. Further, Qualcomm said Monday that it's in a unique position to grow without any outside help: "We are highly confident that the strategy (CEO Steve Mollenkopf) and his team are executing on provides far superior value to Qualcomm shareholders than the proposed offer," said Tom Horton, Qualcomm director. Broadcom's bid last week represented a 28% premium over the closing price of Qualcomm shares on November 2; the AP reports analysts were expecting Qualcomm to reject the $70-per-share bid. 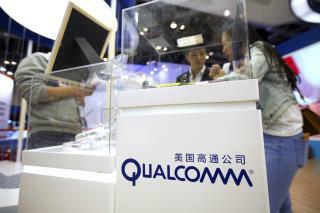 Qualcomm, which makes the Snapdragon chips found in smartphones and tablets, is the world's No. 3 chip supplier, according to research firm Gartner. A combination with Broadcom wouldn't have propelled it past industry leaders Intel and Samsung. Broadcom Ltd. also announced, in the company of President Trump, that it would bring its corporate address back from Singapore to Delaware. The company hopes the change will make it easier to get deals done and, more specifically, help it avoid a cumbersome federal review process for a $5.5 billion deal for US network provider Brocade Communications Systems. The deal has been delayed by the Committee on Foreign Investment in the United States, which investigates proposed acquisitions of US companies by foreign buyers on national security and intellectual property grounds. Anyone want to buy the domain name "commcom"? Pfft: Just wait another year or two ~ when the headlines are about Amazon trying to buy-out U.P.S. &/or Wal-Mart.